I wanted something a little special for Easter weekend here. 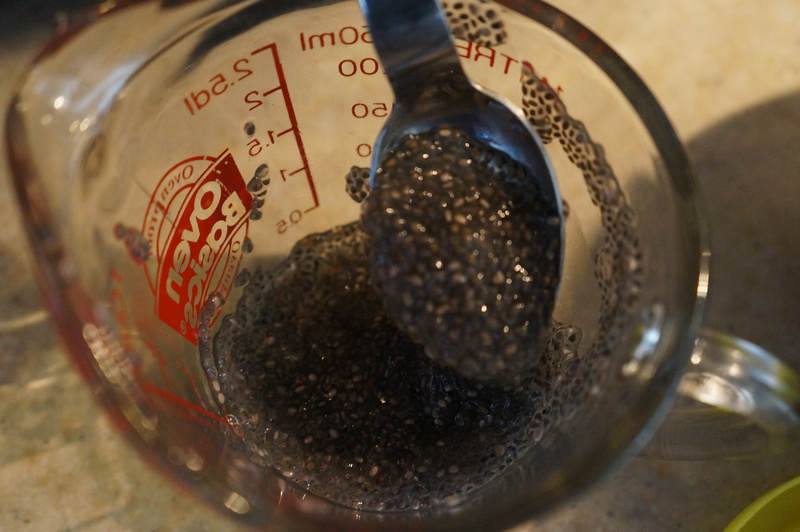 I also wanted to try out chia seeds as an egg replacer. My third reason for making these was to try to include my little dog, Charlie, in our breakfast. He is allergic to eggs so if I could pull these off he could take a break from his usual oatmeal breakfast. So I took a simple recipe I already had and adapted it. I was not expecting much, but these were really excellent! I am amazed at how well the chia seeds stood in for eggs. I only ate 2 of these and I’m satisfied. I have lost 5 pounds in the last month and I wouldn’t be surprised if chia seeds have a lot to do with that! I’m fuller longer and I don’t crave sugar. I see how they help stabilize the blood sugar. Charlie was impressed! His pancake disappeared in a flash! 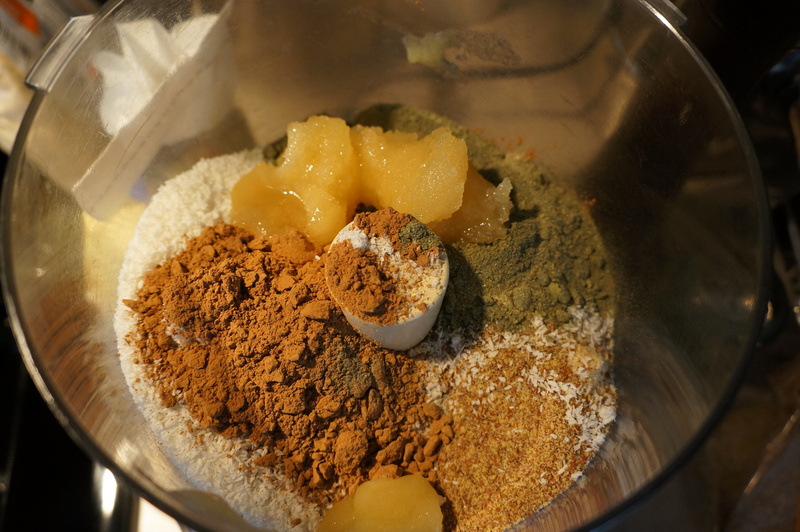 Put first 4 ingredients in a bowl (the dry ingredients). Drizzle oil all over in the bowl, add chia and rice milk. Stir until everything is mixed. Add rice milk if necessary. Heat a cast iron pan on medium-high. Coat with coconut/olive oil. Use a big cookie scoop or heaping teaspoon to spoon batter into pan. Turn after pancakes puff up a bit. 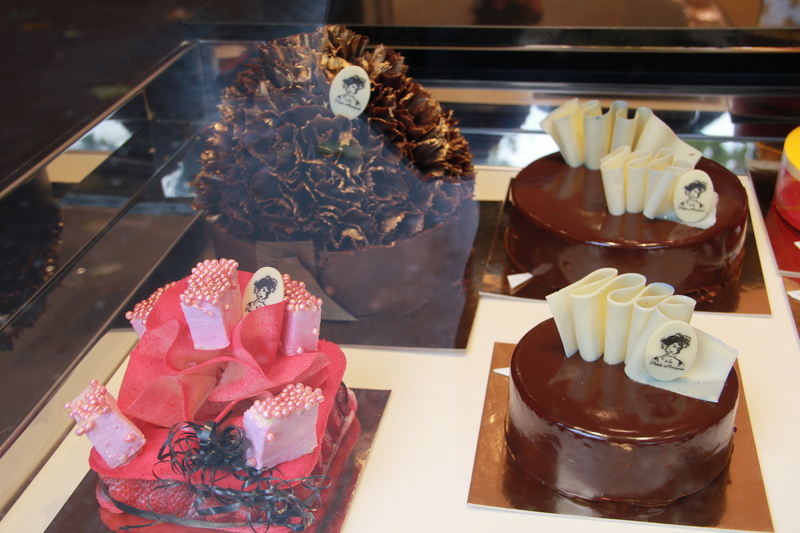 Enjoy with fruit, real maple syrup, etc. Reheat leftovers in a toaster oven for a quick breakfast the next day! I met with my doc yesterday and we both agree that veganism is just too hard! That said, I am eating no red meat nor dairy, and very little animal products at all. Some days are vegan for me, but I’m not killing myself to keep it up. So all in all I have still reduced the inflammatory load on my system by making my diet very clean. 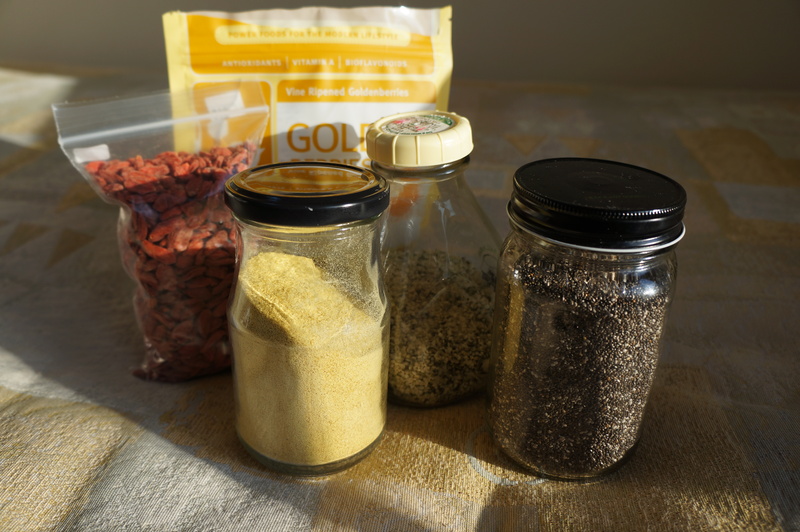 On top of that, I’ve boosted my intake of this new category of foods known as superfoods which are chock full of nutrients the body loves. It’s been fun to play with these new foods. I’m still enjoying the Superfood Kitchen book and now I’m looking forward to Julie Morris’ new book on using superfoods in smoothies. Today I made a rice milk, frozen strawberry/blueberry/kale, stevia, vanilla, chia/hemp smoothie. I wondered if the kale would kill it with yucky greens taste, but no, I couldn’t even tell it was in there! By the way, I had a cholesterol test done at the local Walmart clinic because I didn’t want any dubious results in my medical record since I pay for my own insurance and it could be disastrous if I got a bad result recorded in my record. So, I was Mary Smith for the day and for 70 bucks I found out I have a perfect cholesterol panel and perfect glucose as well. The nurse practitioner said, “I wish I had numbers like these.” I replied, “That’s a lot of vegetables and exercise!” She admitted, then, that she should give up junk food. Well, at least there was an acknowledgement that my lifestyle has at least contributed to those numbers! 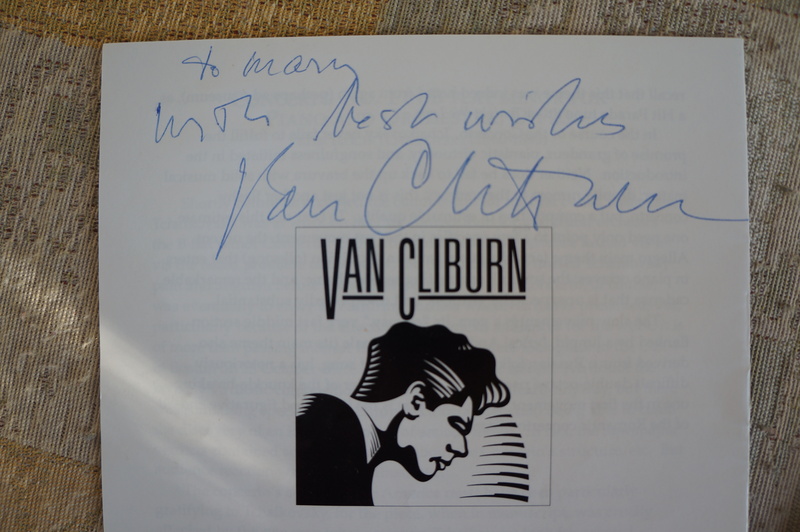 I was sad to hear Van Cliburn passed on February 27th. I had the pleasure of meeting him in 1994. He is the world famous pianist who triumphed in the inaugural 1958 Tchaikovsky piano competition in Moscow. He came to Milwaukee, Wisconsin on Sunday, August 14, 1994 where he played at the Marcus Amphitheater with the Moscow Philharmonic. It was truly spectacular. My husband and I went to the concert and as we were walking out to the car we passed a big garage door. My husband said, “He’ll probably drive right out that door soon.” We decided to wait for him! Sure enough, in just a few minutes, a long black limo drove out that very door. We got behind and followed. While driving we discussed how it would be great to get his autograph on the back of the program which had a great logo of him (Bill’s idea, he has a great eye for these things). We got to a stoplight and Bill said, “I’ll pull up next to the car, you try to get his attention.” So, although I felt foolish, I rolled down my window and waved the program at the black-tinted windows with pleading eyes. After a brief delay, the limo window rolled down!! I jumped out of the car and ran to the door, and there he was against the far corner. He acted astonished that I was so thankful! He turned over the program to sign, but I said, “No, please sign the back.” He said, “The back?” When I explained that it would be cool to have his signature near the great logo, he understood. Within seconds the car was surrounded by young people (piano students, I presumed) and he stayed at that stoplight and signed until everyone got their autograph. He was sweet and humble and really gracious. Thankfully, it was late and there wasn’t a lot of traffic disturbed by all the stopped cars. We followed the limo to Giovanni’s Restaurant, a well-known Italian spot which was closed, but apparently available for this special guest. Later I sent to the newspaper for a copy of the photo used in the review. I was going to frame the group. 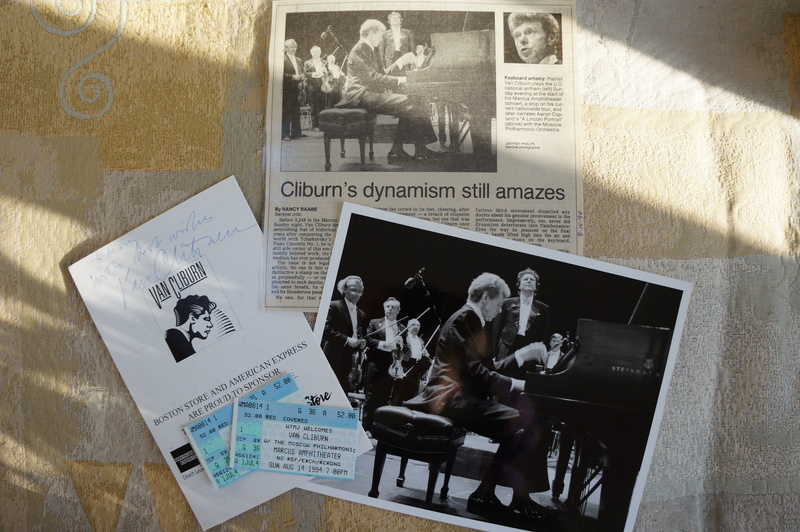 I never did, but reading about Van Cliburn’s passing this past week, I pulled out the papers and had a good reminisce! 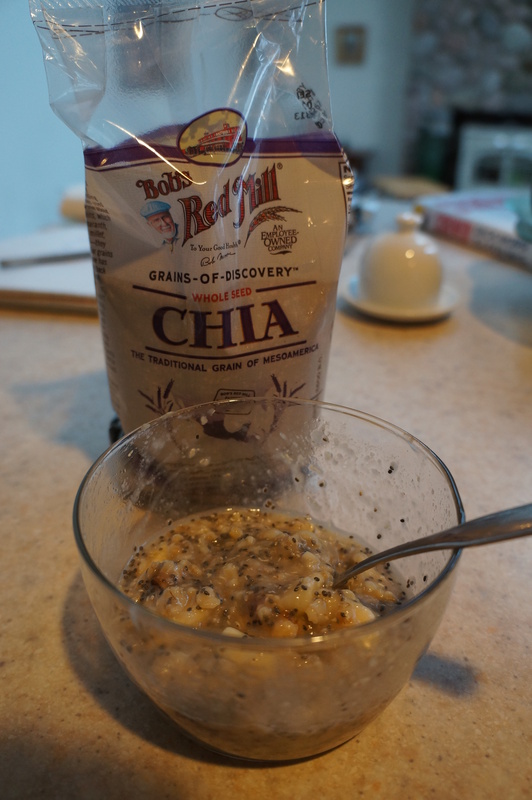 Continuing on my superfood path, today I added Chia seeds to my morning oatmeal. This 1 lb. bag provides 35 servings (1 T. each) for $8.49. This means per serving I’m paying about $0.24. In that serving I am getting a nice dose of protein, omega-3 essential fatty acid, an abundance of antioxidants, a nice blend of minerals and some vitamins. The fiber content is impressive at 5 grams, that’s 20% of my daily requirement! Thrown into oatmeal, it gave a nice little crunch with no discernible flavor. Chia seeds will absorb 9 times their weight in water meaning they expand inside you and make you feel full longer. Great for anyone trying to control their weight. As they expand they plump up and form a gel around each seed (remember painting the soaked seeds on the chia pet?) This is reminiscent of an egg and it will bind like an egg if you soak the seeds first and then add to baking. Nice for anyone avoiding eggs in their diet. Normally I get hungry mid-morning even with a solid breakfast like oatmeal. Not today! The chia seeds kept me filled up until lunch. I think these are now a daily addition to my diet. Next I’m going to try them in fruit smoothies. Ground Almonds (could use any nut) 1 C.
Green mix of spirulina/chlorella – 1/4 C.
Grated coconut – unsweetened – 1/2 C.
Honey – local, raw – 1/4 C.
Applesauce – organic – 1/4 C.
Cherries – dried, tart – 1/2 C.
Whip everything together in the food processor except the cherries. Add last for just a quick mix-in, not to chop them up. 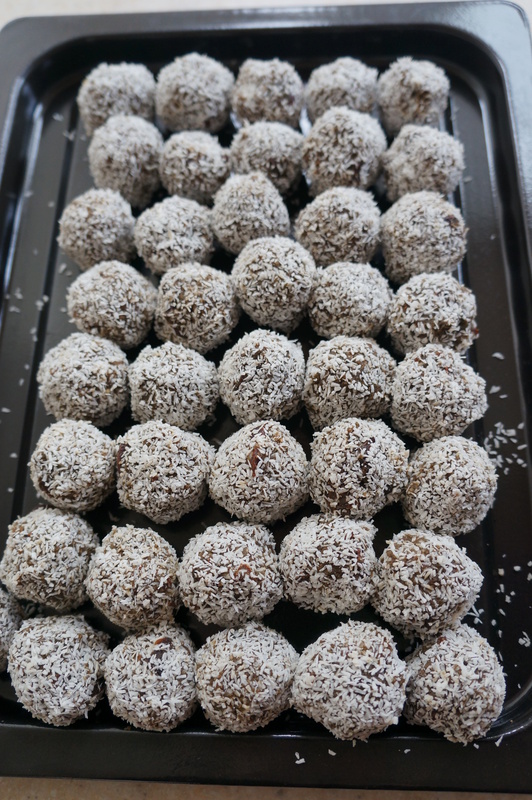 Make small balls and roll in more unsweetened coconut (or ground nuts). Freeze. Enjoy frozen! I’m pretty amazed at how you can’t taste the spirulina or chlorella at all. These energy balls taste great and make you feel great too! This is an important concept of the book. That is, an eating experience includes the after affects. When you eat something that you really enjoy and you feel light, energetic and strong afterward that is the best eating experience! Today I’m off to get some chia seeds. I can’t wait to use them and report back. 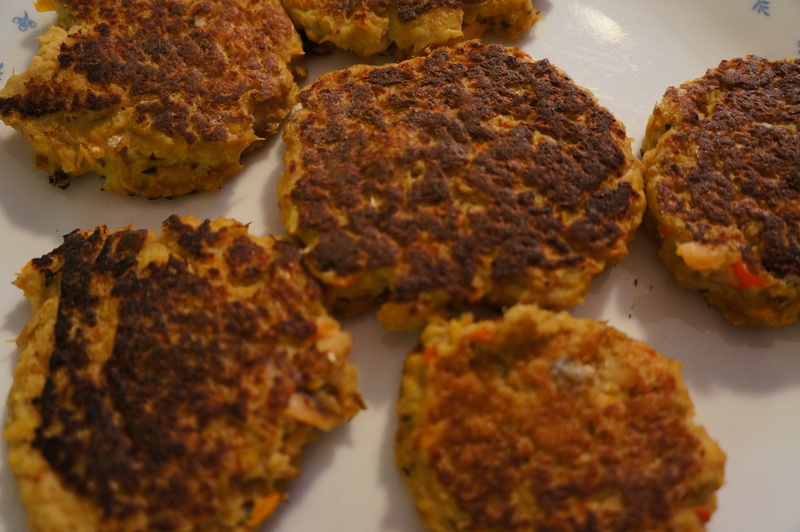 These are so easy they are my go-to meal for dinner when I just don’t know what to make. Try it! Canned salmon is often the healthiest and cheapest form of the fish. I get mine for $2.49 a can and it’s wild Alaskan salmon! First, open the salmon, you can open as many cans as you like. I usually make 2 which allows for leftovers the next day. Talk about a slam-dunk on being paid back for my time investment here! Drain the fluid from the cans and plunk them into a bowl. Some people just mash them up as is. 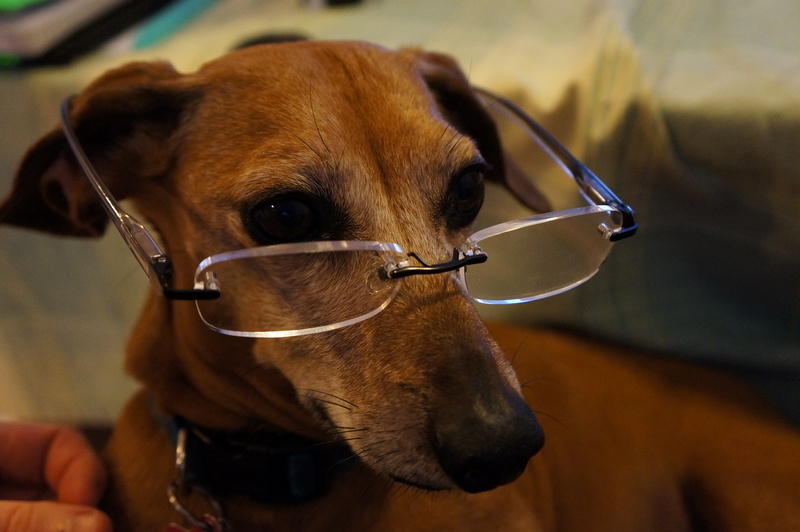 I remove any spines, spinal cords, and big hunks of skin with a big spoon and add those to my dogs’ food – they love it. It’s up to you how much of that you want in. When you mash it, you definitely can’t even tell that stuff is in there. 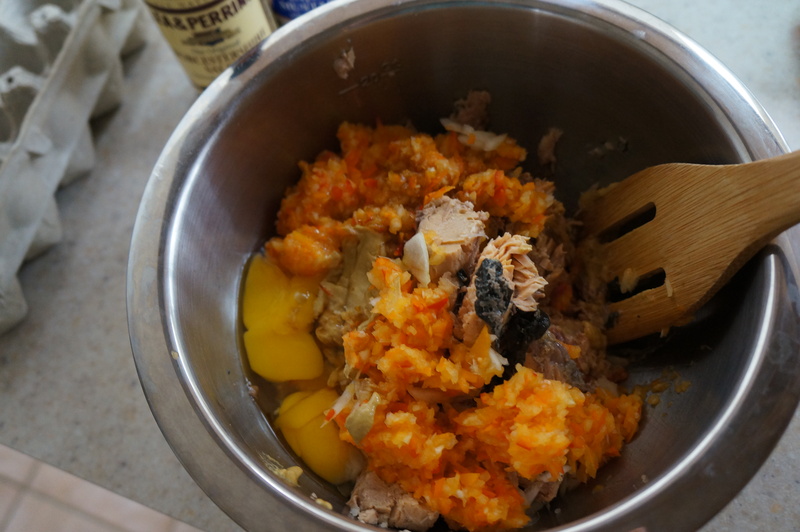 Use a food processor to finely chop onion and red/orange/yellow peppers and throw that in. Experiment with amounts, you really can’t go wrong. You can use a knife and chopping board, of course, just don’t get lazy and quit too soon! It is definitely better to have these things finely chopped. Add 1 egg per can, a schlock of dijon mustard (maybe 1 T. per can or so), and about 1 T. worsteshire sauce per can, soy sauce, or fish sauce. You need it mostly for the saltiness. So obviously, you could just use salt instead if you want. I would mix it up and cook one to see if it’s enough. You can always add more. The last ingredient has to soak up some liquid. 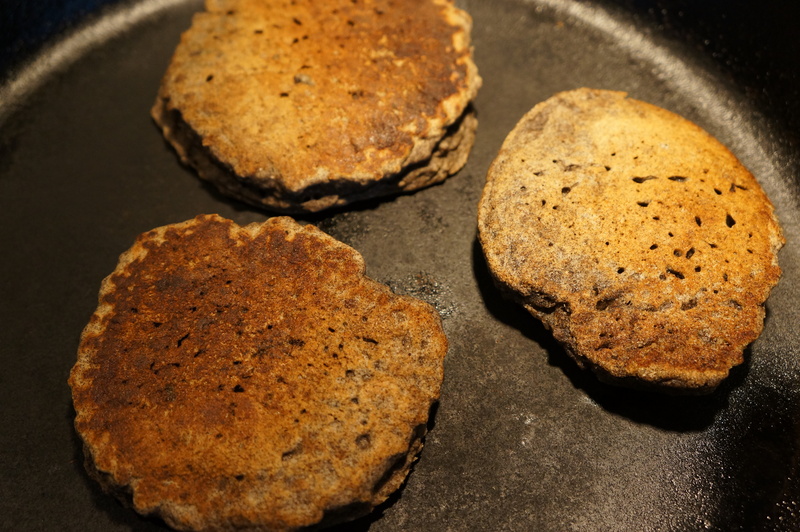 You can use bread or cracker crumbs, rolled oats, oat flour, or the like. It just has to get to a nice sticky consistency. So start with 1/4 C. and see how it looks. These are great with a salad or on a sandwich. You can use tarter sauce if you like, but I like them as is. Here is a nice dose of fish oil that actually tastes good! Just images today. 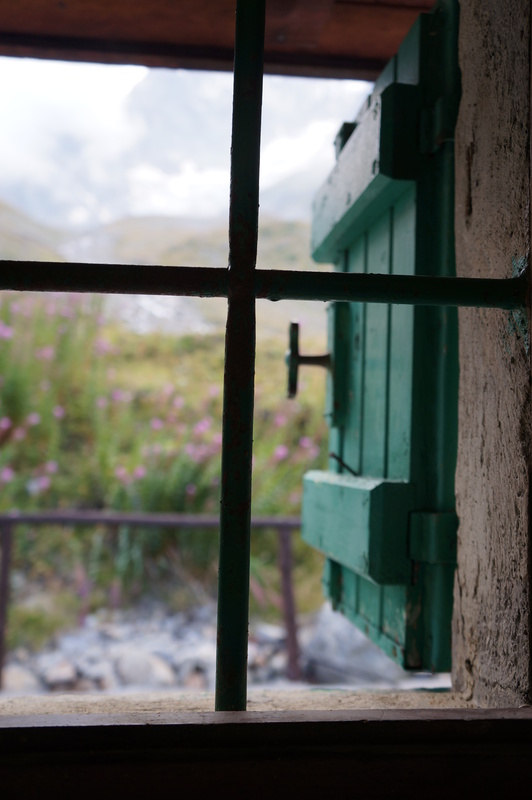 This is out the window of the loo at Rifugio Elisabetta. Mountain with glacier beyond and just the lovliest little window! 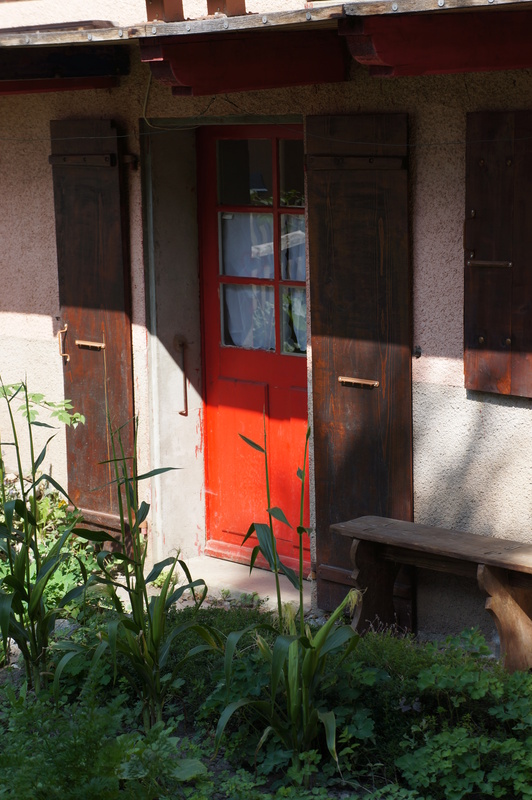 A little red door in the Swiss town of Praz de Fort. Strangely, no one was sighted in this little town as we wandered through! 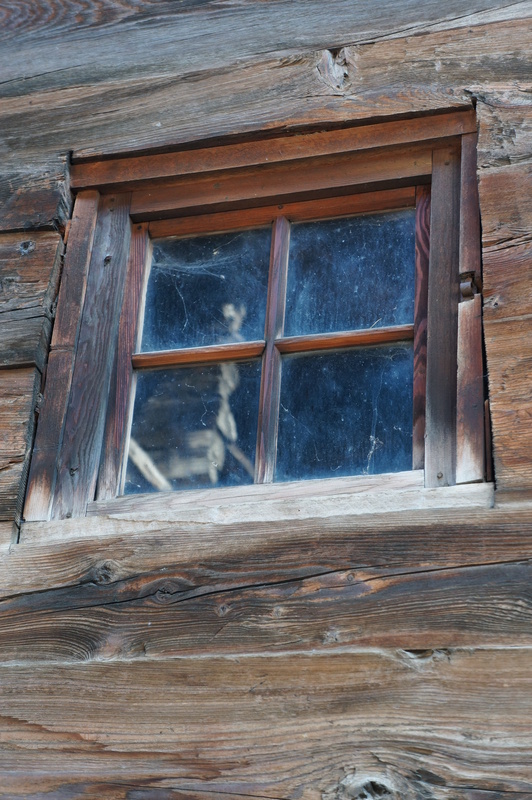 Praz de Fort again, I think, on one of the really old barns right next to the route. 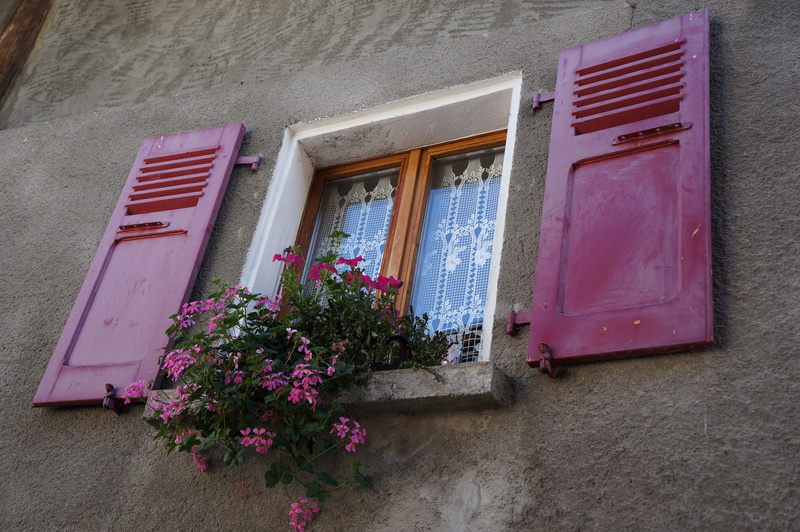 This was either Praz de Fort or Issert, two charming little towns in Switzerland right next to each other so that you aren’t sure which one you are actually in. Again, not a single local person sighted. It was oddly quiet but very beautiful. 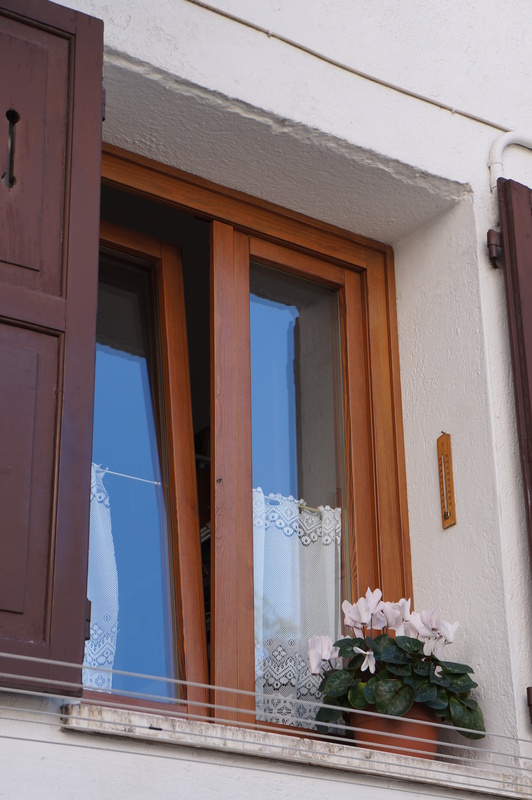 A little white lace and a white potted flower and the window intriguingly open just a bit. Courmayeur, Italy. All photos used on this blog are the sole property of Mary McCluskey. If you wish to use one, please be polite and ask. Have you ever seen such pretty and temporary things? Why is it so difficult to find anything similar in the U.S.? 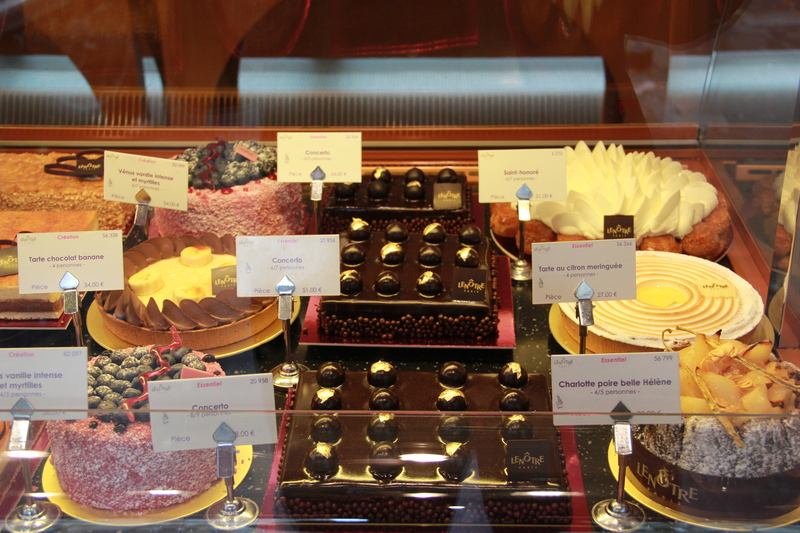 The pastry shops of Paris make you feel like you are eyeing beautiful little sculptures, exquisitely handcrafted, just today! 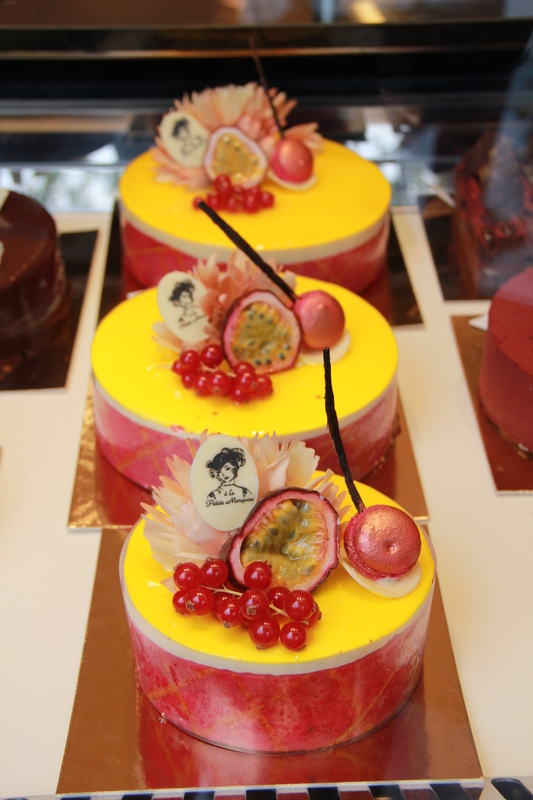 They taste as good as they look too. This is quite a feat. 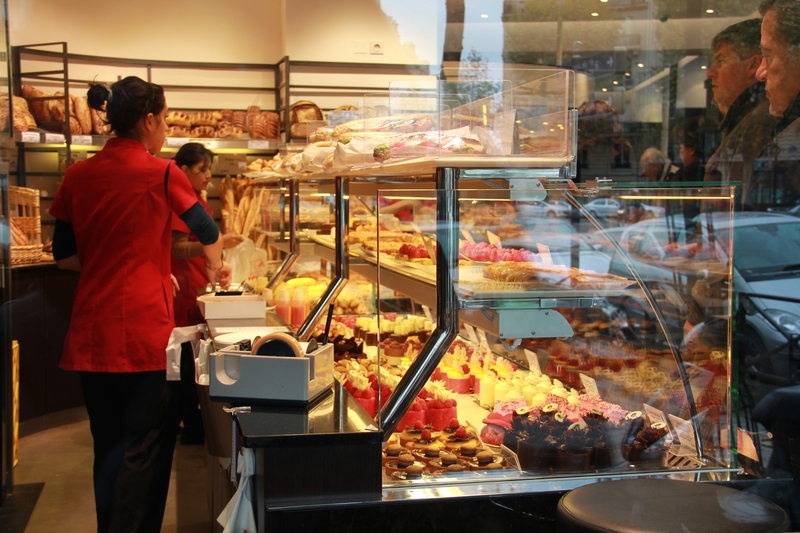 I am dismayed at the garbage sold in U.S. groceries that passes for pastry. Can you even find anything that isn’t loaded with chemicals, hydrogenated oil, and pure ugliness to boot? Just last week I was in a little local diner known for their good pies. I assumed they were all handcrafted on site, but off-handedly I asked, “The pies are all made right here, right?” Well, can you guess the answer I received? “Yes, but the crust we buy from somewhere else.” What do you think that crust was loaded with when I asked for ingredients? Oh, just forget it, I’ll make my own. I am feeling hopeless for my fellow countrymen today and needing a Paris fix soon, I think. Here is how I make the perfect popcorn: Get out the big stockpot and put a schlock of coconut oil and a schlock of lard in it. (Schlock = maybe 2 t.) Heat up on medium-high and throw in about 3 handfuls of popcorn kernels (until the bottom of the pot is covered). While that gets going, put about 2 T. butter in a little stainless steel pitcher and heat to melt. 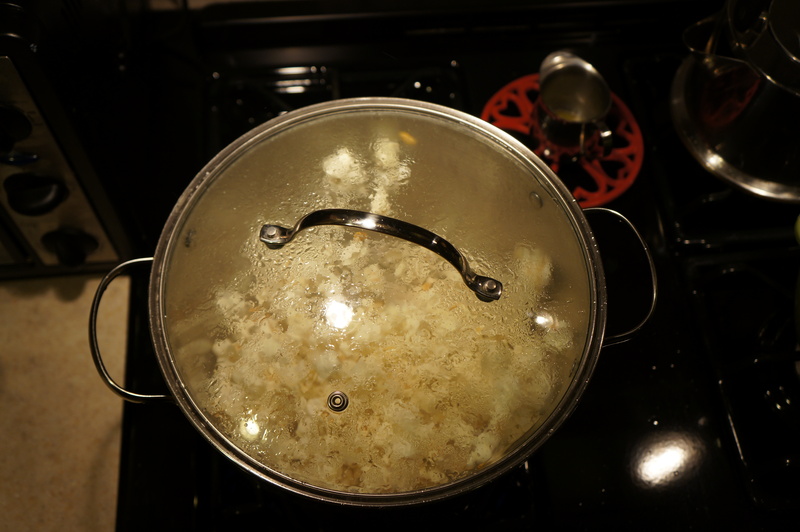 Lift and shake the popcorn pot a few times to make sure the kernels aren’t sticking to the bottom and burning. As the pot begins to fill, take a big spoon and scoop into the corn to the bottom to check on the number of unpopped kernels. If they are mostly popped, shut off, it’s done! Drizzle the butter on it and sprinkle with good sea salt. Enjoy! Just a note about lard. Please do not buy the yucky stuff that you find in typical American supermarkets. It’s filled with hydrogenated oil! I really don’t understand that. My dad speaks of growing up on the farm where they kept a huge barrel of lard under the sink at room temperature in the kitchen and it kept just fine without any additives. Well, anyway, seek out a good source of pure lard from a farmer or else forget it. You can use coconut and olive oil or butter if you have to. Also, try this even if you have one of those ridiculous air poppers from years ago. You will be amazed at the pleasant soft sound of popcorn kernels popping on the stove. It shouldn’t require protective ear covering to cook! And get over your fear of fat. It’s not the 1980s anymore. We now know that small amounts of good fats are essential for health. I had been to Paris twice before and managed to miss this fantastic museum both times, so on this trip it was what we did our first day! It surpassed everything I had imagined. 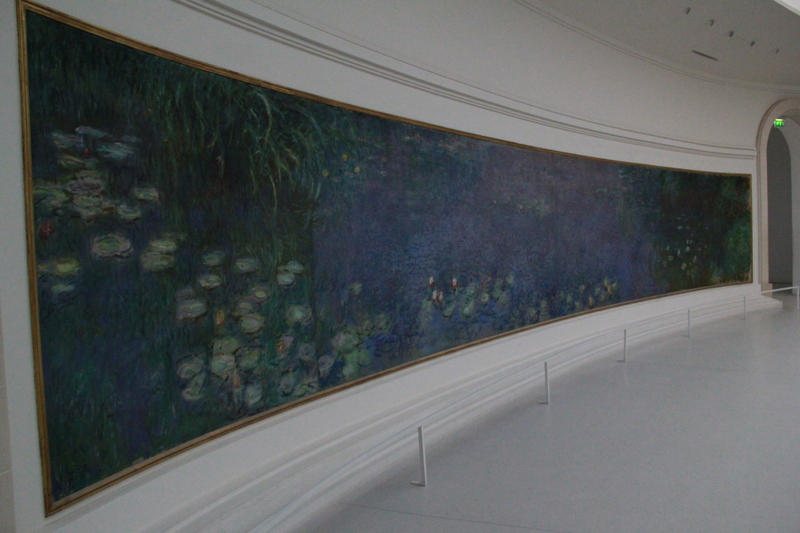 These rooms were specially designed to host Monet’s masterpieces, the Nympheas or Waterlillies, in 1922. 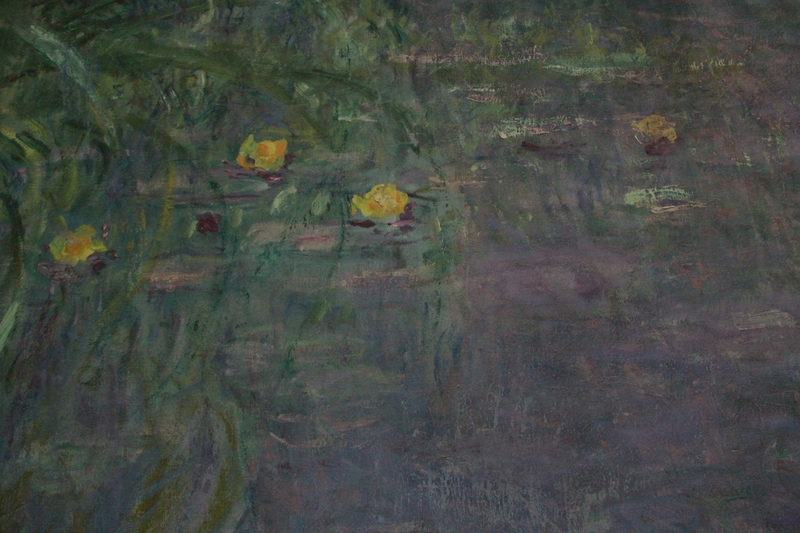 Monet worked the last 30 years of his life on these works and he could not give them up to the museum so he died with them in his possession and they were installed posthumorously. 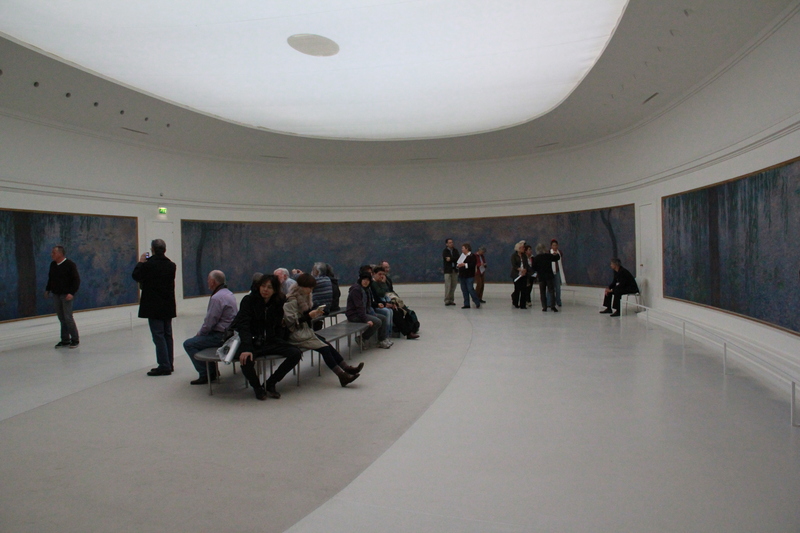 There are two big oval rooms, one depicting the pond at dawn and the other at dusk, all lit with natural light and almost nothing else except a minimal bench in the middle from which you can rest and take it all in. 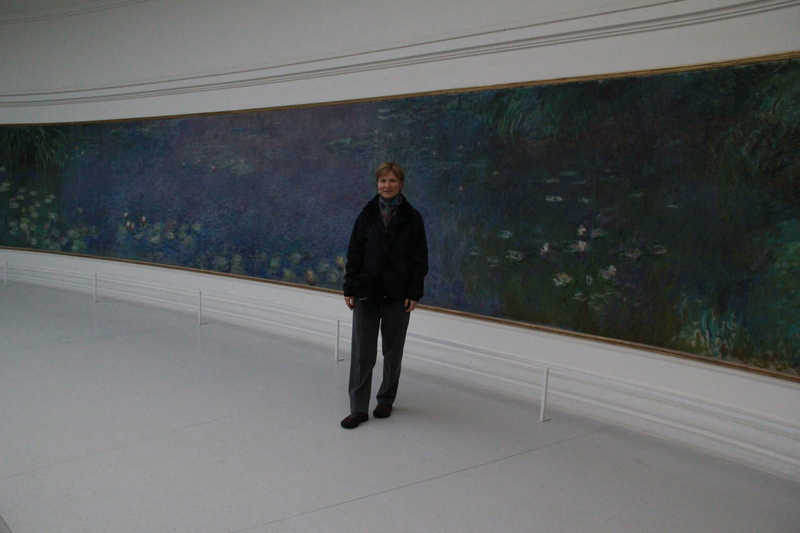 The paintings, 6.5 feet tall, and if lined up side by side, 298.5 feet in width, encircle you. And yet, you can get right up to them and look at each brush stroke. It’s almost like traveling through time, the brushstrokes look so fresh, like he just put them down. From the middle you are in the pond, up close it’s an abstract colorful free-for-all! How did he do that?! 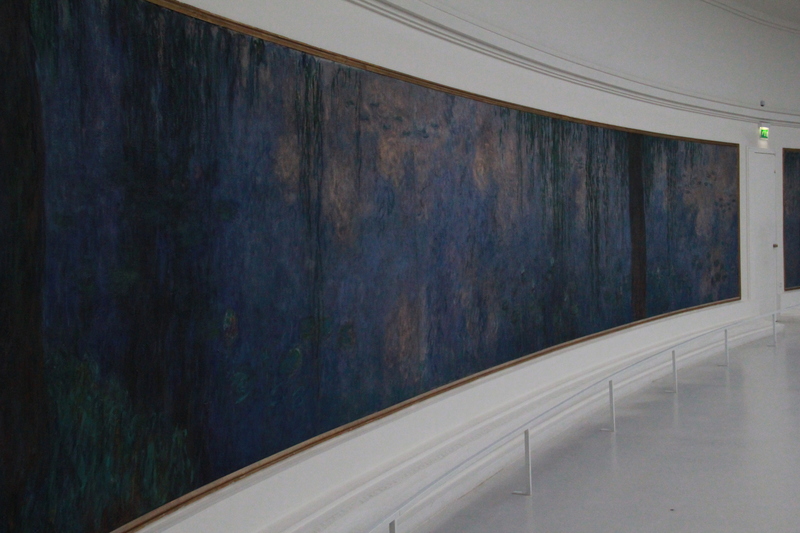 I will definitely return to this little gem of a museum the next time I’m in Paris. 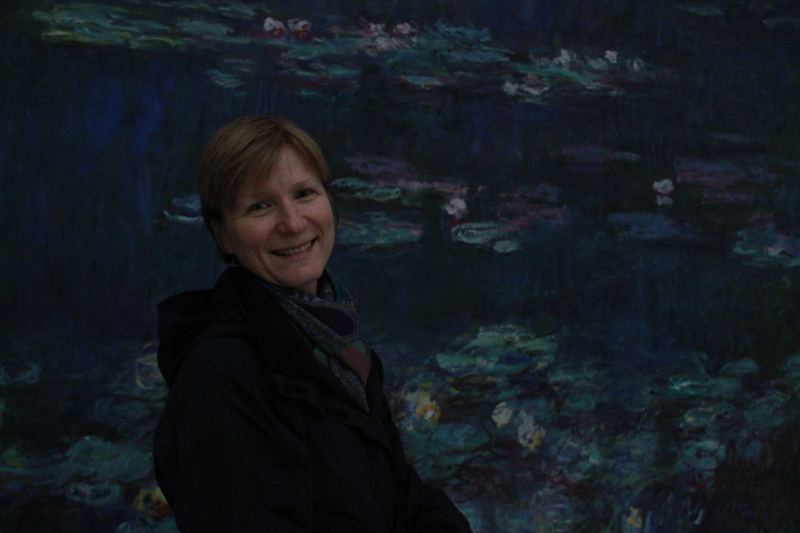 There is now a wonderful additional museum space in a basement opened in 2006 to hold the Walter-Guillaume collection of Impressionist paintings. The history of this building and its holdings is pretty interesting. See http://www.nytimes.com/2006/05/16/arts/design/16oran.html?_r=0 for a quick description.